What’s the best time to start the Pacific Crest Trail? Most northbound thru-hikers start the PCT in mid-April through early May. Southbound hikers generally start in late June through early July. Many people want to start early. Beware. Snow covers sections of the trail in the spring and early summer. In Southern California, dangerous stretches blanket the trail within the first 200 miles of the border. If you head into the Sierra too early, you’ll face significant snow and stream crossing obstacles. In Washington, steep, risky snow slopes turn PCT travel into mountaineering well into early July. Late starts also present problems. Southern California can be dangerously hot and your safety may be at risk. If you’re starting late and plan to do the whole trail as a thru-hike, you’ll face other problems. 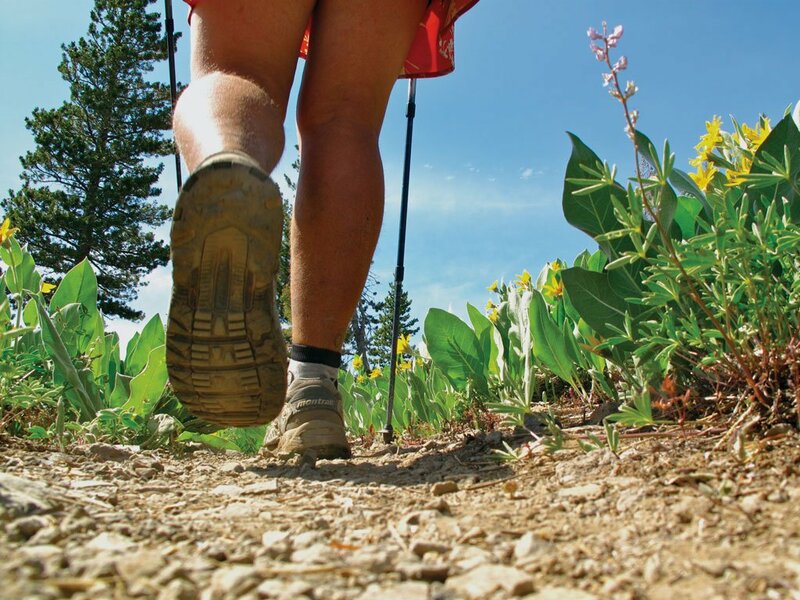 Are you fit and lucky enough to be able to sustain endurance power-hiking? Will winter shut down travel before you are done? We recommend studying the conditions and starting around the “usual window” of opportunity. How long does a PCT thru-hike take? The trail is 2,650 miles and it generally takes the entire snow-free season to walk. That’s about 5 months. Elite athletes who are experienced on the PCT have finished the trail in as little as two months. The few who achieve sub-100 day hikes average well over 30 miles per day. That’s an incredible achievement. More average hikers take the entire season. Whether they’re out for 4.5 months or 5.5 depends on small differences in daily mileage and time off in towns. Rarely, people successfully stay on the trail for six or more months. Beware that extended itineraries generally include snow travel or extensive time waiting for it to melt. Frequently, people that are on the trail during the wrong season have to quit due to dangerous snow conditions. Being on the trail during early winter snows can be deadly. What permits do I need for the PCT? Head on over to our permit page for all of the details. Please apply for your permit at least three weeks before the start of your trip. Did you wait too long? You can go in person to the local ranger station and be permitted for a few weeks like other backcountry users. If you’re not starting at the Mexico border, it’s possible that the start of your hike doesn’t require a permit. You might be able to head out on the trail while you wait for your long distance permit. The local permit will cover you for the start of your trip while you wait for your long distance permit to arrive. How do I get to the trail from San Diego? Read how on our PCT transportation page. Will I need an ice axe, crampons, climbing rope, skis, or snowshoes? This depends on season, snowpack and your personal risk tolerance. Many northbound hikers carry an ice axe and hiking crampons starting at Kennedy Meadows. Falls on steep, potentially icy snow can be a real danger. PCT hikers have been saved by these safety tools and their knowledge on how to use them. If you’re carrying an ice axe through the Sierra, you’ll probably want to keep it until you are north of Sonora Pass (which can be dangerous). Read our page on snow information. Some seasons, they may be required in the mountains of Southern California. San Jacinto and Mt. Baden Powell are generally the problem spots in Socal. Can I climb Mt. Whitney while on my thru-hike? Yes, and the view is fantastic! You’re welcome to day hike to the summit. PCT long-distance permit holders are not allowed to camp east of the Crabtree Ranger Station – that includes no camping at Guitar Lake or on the mountain itself. What about reassuring family or friends at home while I am on the trail? Have you read about the critical importance of leaving a trip plan and having a communications plan? Share that page with your family as well. Generally, it’s not hard to stay connected for those who carry modern technology. Cell phone reception is sometimes available on the trail. You can also carry an emergency locator beacon such as a PLB or a satellite messenger that works when you’re away from cell towers. You may be able to supplement occasional phone calls and letters home with messages relayed by hikers, riders, or others you meet along the trail. Finally, the more your loved ones know about the trail, the better. The PCT is fairly well marked and described on maps and in guidebooks. The trail tread is also well defined. If you have decent backcountry fundamentals, you should be able to find the trail easily when it’s not covered in snow. Where should I report problem trail conditions? Mark them on your map and send in a report on our trail conditions webpage. If it’s a really important and pressing update, call the PCTA at 916-285-1846 and the local ranger station (or if it’s a true emergency, call 911) to report the problem. We’ll share the information with our crews, partners and the trail community in general. Please be as specific as possible. How much will it cost to thru-hike the PCT? A typical hiker spends between $4000-8000+ on a thru-hike. Do you like fancy hotels and nice dinners? Are you eating baloney sandwiches and skipping showers? Did you have to visit a doctor or take a week off in town? Are you including the cost of insurance in your cost calculation? Transportation? As in life, people spend wildly different amounts of money. Beware of starting with too little. The trail can be expensive. Many people under-estimate how much the experience will cost. Running out of money is one of the most commonly cited reasons for why people quit the trail. How long does it take to plan, train, and get ready for a PCT thru-hike? For many, it’s longer than it takes to hike it – maybe 6 to 8 months. Some people are ready within a few weeks of deciding to go. It depends a lot on your life situation. Do you need to sell a house? Are you already free ranging and jobless and have plenty of money? Sorting out resupply strategies and securing permits can be a quick process compared to getting your life in order for a five month adventure. At the minimum, you should have a few weeks to secure transportation to the border and permits to hike. How warm a sleeping bag do I need? Depends on the individual, but most hikers find that a down or synthetic bag rated at +15-20° F is a good compromise between warmth and weight/bulk. You will need to protect your bag and clothes from rain and immersion during river crossings. How many people start and finish thru-hikes of the PCT each year? We really don’t know. Take a look at our visitor use statistics page and 2600 miler list for our best guess. Who’s the youngest? Oldest? Fastest? Sorry, the PCTA does not validate, nor verify, records. They’re fraught with arguable points and are difficult to authenticate. We limit ourselves to stewarding the list of people who reported finishing the trail and instead focus on the important work of preserving, protecting and promoting the PCT. Why do most thru-hikers head north? Partially, it’s culture. PCT hikers go north because that’s what most people do. It also allows for more water in the desert and an easier start compared to a snowbound North Cascades. We think that more people could consider southbound hikes. Read more on our Northbound vs. Southbound page. I’m coming from abroad. What visa do I need? Have you read our advice for international hikers yet? Generally, long distance hikers should look to obtain a six month multiple entry B-2 visa from their local U.S. embassy. International visitors on a six month B-2 visa should plan to complete their hike (including time before and after the trail) within their six month window. You may, or may not, be able to extend it while in the United States. If you will be in the United States for less than 90 days, some international visitors do not require a visa. We recommend reading travel.state.gov for official information. A multiple entry visa should allow you to re-enter the United States if you hike into Canada. All other permits apply. Please consult the U.S. Department of State or your visa adviser for official information about U.S. visas.